We were surprised and dismayed to see that bow hunting has been sanctioned on Spy Glass Hill in the heart of Rothesay. Many of our four-legged friends along with their two legged masters (Mama’s friends) walk there as well as the mountain bikers from the school we frequently come across. We saw some plain yellow circular metal discs nailed to some trees and we didn’t know what they meant (nor did anyone we came across). Mama noted the numbers marked on them and did a Google search as soon as we got home. Low and behold it means that bow-hunting is allowed in that area!!! With so many people walking the trails, bikers biking and being located right beside the school, in a residential neighbourhood we were more than a little shocked. Nicholas was really shook up and said, “Come on Buddy, let’s get out of here quick!” This time of year Mama always makes us wear our hunter’s orange scarves (especially me with my white chest, blaze & socks) and Mama wears her bright red scarf just to be sure that no matter where we go hunters will not mistake us for deer. A word of caution to our friends; if you are going anywhere near the Spy Glass or Allison trails or those out behind RNS be extremely careful. You may want to walk somewhere else until the deer cul is over which will still go on for quite some time. We met several people on the trails and none of them knew what the yellow discs signified and only one doctor and his dog were wearing the hunters orange or red like us! Please tell everyone you see on the trails what this yellow disk signifies so that they will be safe. Daddy says the bows today are extremely powerful and send arrows a great distance, most citizens don’t realize how dangerous they are. That’s all Nicholas had to hear and he went scampering home! 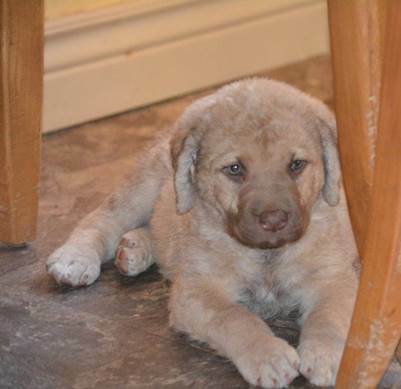 Our dear friend Diane came home Wednesday from PA with her new Chesapeake Bay Retriever puppy name Wind! What a sweat little girl. See her picture attached. Mama is going all gaga over her, (Nicholas and I were feeling a wee bit jealous). She is nine weeks old and wheat coloured which we’ve never seen before. Her sister, Special, is a beautiful mahogany brown. Special is happy to have a new sister but oh that little girl is a handful as only puppies can be! Diane and Special are going to have their hands full for a while. Mama says she can remember when we were little 6 week old puppies and she could carry us around in her arms. Man that wasn’t yesterday. Even as a puppy, Big Buddy Bacon was an armful and a half! Mama says nothing smells as sweet as a puppy! Some days she wishes we still smelled that sweet but if we’ve been swimming those sweet smells are just not going to happen! (You know what I’m talking about)! The team is pleased to announce that we have a new team member, Jody McCairns! A very welcome addition. You can read all about Jody on his bio on our site. He is hosting an open house in the heart of Rothesay at 2 Brock Court, Rothesay with Mama on Sunday from 2-4pm so please drop in and say hello as you view this beautifully updated ranch within walking distance to the Common. Steven is on a well-deserved holiday to the sunny south so the team is filling in for him in his absence. That’s what it’s all about, team work! Together we are here for you! If you are looking for a new house and your four-legged friend has questions about trails, toy stores, groomers, number of friends in the area, just pop me off an email at Buddy@KatherineBacon.com and I’m happy to help! Our new friend Wind at 9 weeks. What a cutie!